As everyone knows, keeping up with today’s fast-paced life is not an easy thing to do. No matter what, we all have to be prepared to face whatever challenges, obstacles and problems happen to come our way. To help and guide you, such that you are able to get things done in a faster as well as more productive manner, given here is a list of things to do every day which you can do on a daily basis so as to make you smarter. These things are very simple to do indeed so once you do them, over a while, they will become a part of your daily schedule without you even making a conscious effort. The following mentioned are few tips on how to become smarter, cleverer or more clever and few daily habits of successful people that helps you improve your life. This is one of the best things which you can do on a daily basis in order to get smart or make you smarter, is drinking two big glasses of water as you wake up. If you do this not only will you feel a little more alive, but at the same time drinking this water will help you so as to not be dehydrated as soon as you start your day. After all, you should keep in mind that throughout the night you have been asleep for roughly eight to nine hours and water is absolutely necessary for waste filtration as well as your fluid balance. Studies have shown that doing this daily, improves your mental ability. Reading makes you smarter is a universal truth. Reading newspaper from cover to cover is something that will not only help you to be better informed but at the same time you will be able to increase your skills of comprehension. Articles written in newspapers are extremely comprehensive, compact as well as articulate. If you get into the habit of reading the newspaper on a daily basis then in time to come you too will be able to express yourself very well. Once you get in the habit of reading, automatically your reading speed will increase and in time to come, you will be inspired to pick up a book. In this day and age all sorts of books and pieces of information are available merely a click of a button away, so in order to becoming smarter, you can download some audio books and listen to them while commuting. This is a very effective practice which many people across the globe do as to improve their listening skills as well as to broaden their horizons. However you should avoid doing this if you are driving or riding your bike as chances are that you might meet with an accident. Technological advancements like this have made it so easy for us to improve ourselves. In order to kick start their day and even remain proactive at work, there are many people across the globe that heavily rely on coffee. Coffee is something that will surely make you feel awake and rejuvenated, yet a much healthier alternative to help you remain mentally and physically healthy is green tea. When you have such a good option like green tea at your disposal, why would you opt for something like coffee, the amino acid contained in green tea has been scientifically proved to cause an increase in the alpha brain power waves, helping you to think better. Yes, it is certainly true that most of us have a soft spot for our chocolates, candies, sweets as well as aerated drinks, but we should try as much as possible to keep these unhealthy treats to an absolute minimum and if possible even not have them at all! As we all are sure to have noticed, that having sugar causes you to feel a number of highs and even lows, having such a fluctuation will not allow you to complete your daily work in a proper as well as effective manner. Rather than having sugar you can substitute it with having something healthy like honey. There is some truth in the common saying that all work and no play makes jack a dumb boy! In order to remain a relevant part of today’s twenty first century business world, we all have to be able to think fast and on your feet as well. Companies are always on the lookout for those individuals who are able to put into practice the practical knowledge which they have as well as those who always have a positive attitude towards their work. Taking naps at regular intervals is something which goes a long way in helping you to function in a better as well as more efficient manner. Owing to the fact that it has become so easy to access the internet on the go, almost 70% of the people that make use of the internet are active on at least one social media site, whether it is Facebook, Twitter, or even Instagram. Of course social media sites do have their benefits as it allows you to get in touch with old friends, yet at the same time spending too much of your time, browsing though your home page is an activity which does not stimulate your mind at all, rather on the contrary it is rather mind numbing! So find more productive ways to spend your time. One of the best things which you can do in order to keep your mind active, is do some cross word puzzles. Millions of people across the globe do the daily crossword puzzles which comes in the newspaper so as to help them improve their knowledge and also to keep themselves mentally fit. In order to keep your mind active and agile it is necessary to keep challenging it. If you let yourself go, then over time you will realize that you are unable to think in a clear and concise manner. Programming is an everyday thing which you can do in order to become smarter. Even if you are not a programmer by profession you could always do some programming in your past time. Some of the key benefits of programming is that it helps you to think in a logical manner and it also increases your problem solving ability. Even if your spend half an hour a day doing this, not only will you get to learn a lot about the art and science of programming but you will also be training your mind. This training which you will be receiving will help you immensely in the long run. In order to be smarter and to think in a clear and concise manner you have to have a healthy body as well. Initially you might find exercising very tiring but over time you will realize that exercising does you a world of good. When you think of the term exercising, most people instantly think of a gym, however in order to help your mental activity you need not necessarily go to a gym. You can go for a walk every morning instead, or your exercise could be in the form of your taking the stairs rather than taking the elevator. Lastly even joining a dance class could serve the purpose well. One of the best things which you can do to help you become smarter is, indulging in stimulating conversations with other individuals. If you seek isolation and only remain immersed in your own thoughts then you will never be able to broaden your horizons. One of the easiest ways to improve your own abilities is by conversing with other individuals and getting to know their perspective. When you put yourself in the shoes of others then you are able to understand their point of view and even understand how many ways there are, to approach one single problem. All of us have to travel to and fro from our place of work or even or place of study and on a daily basis we see several interesting things. A good habit to have, which you can cultivate in order to become smarter is carrying around a notebook and even a camera so as to help you capture or even record anything interesting or note worthy which you come across. When you cultivate this habit, you automatically become more sensitive to the world around you and you even start noticing the things which many people take for granted. It is a universally accepted fact that nature is the best teacher. Even if you happen to spend at least ten minutes of your day in a park or in a garden not only will it do you a world of good in terms of being able to calm as well as sooth your mind, but it will also help you take notice of how beautiful Gods creation really is. If you spend some time in the lap of nature, you can remain immersed in your own thoughts and you can even gain some perspective by temporarily separating yourself from worldly things. Nowadays many of us have the misconception that if we ask questions we run the risk of others thinking that we are silly or foolish. However no matter what, you should never shy away from asking questions as well as clearing doubts. You should always remember that it is only those with a curious bend of mind that are able to put forth stimulating as well as challenging questions. So, you should ask your questions and not worry so much about what others might think of you or what they might say to you. A great way to help you become smarter is by using the resource of the internet wisely and signing up for some online courses where you can learn a number of new things without having to even leave your home! Doing something like this works out great, especially if you are a stay at home father or mother, but still has the drive to learn new things as well as improve yourself. All of us have a number of apps on our phones, a good app which you can download in order to help you learn something new each day is ‘word of the day app’, doing something like this is both fun as well as interesting. One of the simplest things to go to become smarter is simply to keep your eyes and ears open at all times so that you do not miss out on anything important which is happening around you. The more you remain attentive to the world around you, the more things you can do and will be able to learn and the smarter you will become. 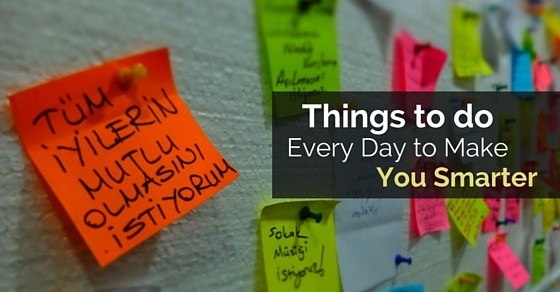 So these are some of the things which you can do on a daily basis in order to make you smarter. No matter what we have achieved or no matter how old we are, we should never stop trying to improve ourselves. You will never be successful in life if you never strive for perfection. If you work hard and always keep your head held high then you are bound to yield rich dividends in the future for all your effort. At the end of the day, it is these extraordinary people who are smart and quick that get ahead in life.